Noted angler, author, and fly tyer Terry Wilson has created a number of original fly patterns for bass, bluegills, and other warmwater gamefish. The Bass Bully is one of his more recent creations. The Bass Bully featured on this page is the smallmouth version of the original Bass Bully used for largemouth bass. The original Bass Bully was designed as a vertical-drop lure with a twister tail instead of a rabbit strip. The recipe for the original Bass Bully can be found in our second book, "Largemouth Bass Fly-Fishing - Beyond the Basics". The Bass Bully has been effective in black, olive, rust, and chartreuse. Depending on how it's fished it may be taken as a crayfish, hellgrammite, sculpin or mad tom (stonecat). 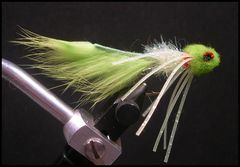 The Bass Bully in the tying sequence that follows is tied in chartreuse. The Bass Bully can be tied with or without a weedguard. If you choose a weedguard, simply tie in a piece of 25-pound test soft mono secured at the hook's bend. You can attach the tip of the mono just below the hook's eye by forming a burnt mono end as you finish off the fly. The rabbit (zonker) strip tail should be the length of the hook plus 1/8th inch. The measurement should be of the hide, not the hide and hair. 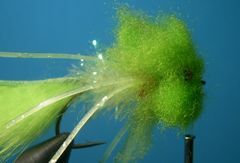 The Zonker strip should be inverted so that the hair faces downward when the strip is attached to the hook's shank to form the tail. The finished Bass Bully will ride with the hook point up when the fly is fished. The chenille for the gills should make a ball. Just make two side by side wraps and add a third wrap between the first two wraps. The finished wraps should appear rounded like a small ball. The ball helps flare the legs of the fly. The gills also provide a contrasting color. Use two full strips of Sili-legs cut in half to create two pairs of legs tied with two strands on the bottom of the hook and two legs tied above. Tie them in place so they extend away from the hook's shank at roughly a 90-degree angle to the body. If you haven't used wool to create the head on a fly pattern, don't be intimadated. It's easy to do as you will see in the tying sequence. The sculpin wool for the head is the same wool found in aviator jackets. It may be listed in fly tying catalogs under a number of names including lamb's wool, ram's wool, and sculpin wool. 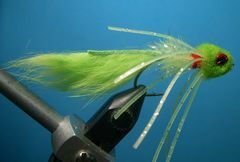 The Bass Bully can be fished along the edges of shoals and boulders, cast into the seams of converging currents, and fished as a true vertical drop fly in slow pools. Students in our warmwater fly fishing school consistently caught more large fish on the Bass Bully that on other flies. The weight of the Bass Bully can be adjusted by altering the size of the barbell eyes. I prefer to use extra-small barbell eyes and then use a sink-tip or full sinking line to get the fly down but medium barbell eyes are important if you need to get the fly to the bottom in current as is frequently the case in smallmouth streams. The Bass Bully with extra-small eyes casts well on a five or six weight rod but a Bully with medium eyes really requires a seven or eight weight rod to keep from you from making "Chuck and Duck" a full-time contact sport. I prefer to use eight to twelve pound test leaders and often attach the Bass Bully to the tippet with a fixed-loop knot to accentuate the action. My favorite presentation is to allow the Bully to settle to the bottom. Then I point the rod tip directly at the fly. I remove the slack in the line, then lift the rod tip four to six inches, then drop the rod tip back to its original position and strip only to remove any slack line. This "lift-drop-lift" strip retrieve causes the fly to swim off the bottom as if trying to escape. When the Bully settles back to the bottom the retireve is continued. The first time Roxanne and I fished the Bass Bully was an early morning on the Buffalo River in Northwest Arkansas and in the first few minutes of the outing I caught the smallmouth bass that is on the cover of our latest book, "Smallmouth Bass Fly Fishing". Clamp the hook in the vice and crimp the barb. Attach the tying thread and lay down a base of thread back to the hook's bend as shown. Cut a piece of rabbit (zonker) strip for the tail. The hide of the tail should be equal to the length of the hook plus 1/8th inch. Attach the rabbit strip to the top of the hook's shank with the hide facing up. 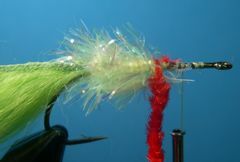 Tie in a piece of Ice Chenille or Estaz at the base of the rabbit strip tail and wrap the chenille forward to the mid-point of the hook's shank. Tie off the chenille with a couple wraps of thread and remove the excess. Tie in a piece of red chenille, for the gills, at the base of the Ice Chenille body and make two side by side wraps of the chenille followed by a third wrap in the middle of the first two wraps. Tie off the chenille and remove any excess. This is how the ball of chenille should look after it has been made and prior to the next step. Cut in half two full strips of Sili-legs to make the two sets of legs for the Bass Bully. 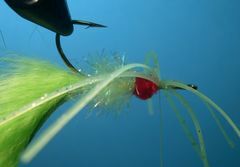 Invert the fly and tie in the first set of legs with figure-eight wraps on the bottom of the hook's shank at the base of the gills. Without moving the thread, return the fly to the upright position and add the second set of legs on the top of the hook's shank. Next, stroke the legs back with your free hand and take a couple of wraps of thread rearward over the legs so that they flare out at a 90 degree angle to the body. Now tie in the lead barbell eyes with several figure-eight wraps at the base of the legs. You may want to use a bit of super glue to make sure that the eyes are tightly locked in place. Tie in a small bunch of wool on top of the hook's shank behind the lead eyes with two or three wraps of thread directly on top of each other in the center of the wool. Without moving the thread, invert the fly and tie in another bunch of wool on the bottom of the hooks shank. Move the thread to directly in front of the lead eyes and return the hook to the upright position. Now, repeat the same process at the front of the eyes by adding a small bunch of wool on top of the hook's shank and another small bunch of wool on the bottom of the hook's shank. 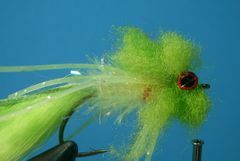 Tie off the thread with a couple of half-hitches or a whip finish and you are ready to trim the Bass Bully's head. With serrated scissors trim the wool head to this shape so that they eyes show. Curved serrated scissors work best for this job. Once you are satisfied with the shape of the head your Bass Bully is ready to take fish.